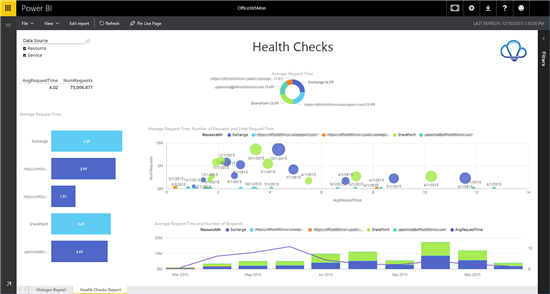 Office365Mon allows you to track the availability of your Office 365 environment. 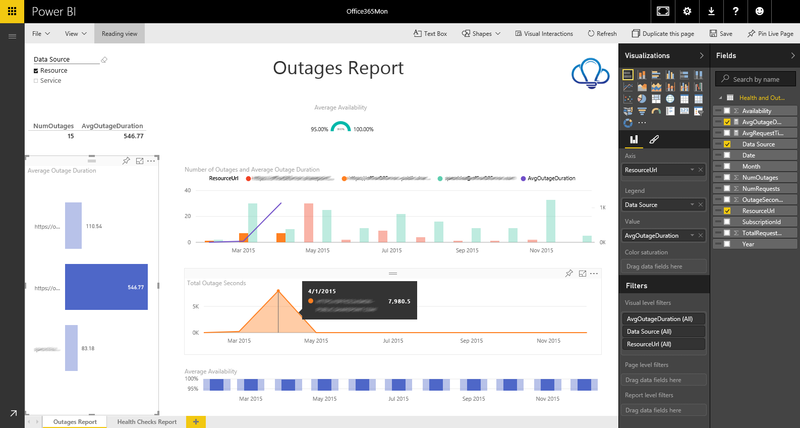 Analyzing your Office 365 outages and health performance data is easy with Power BI and the Office365Mon content pack. Power BI retrieves your data, including outages and health probes, then provides out-of-box dashboard and reports based on that data. This post will provide an overview on how the Power BI content pack helps users explore and analyze Office365Mon data. For additional details on how to get started, please see our help page. Start loading the content pack by connecting to your Office365Mon admin account in Power BI. Once the content pack is loaded, you’ll see a new dashboard, report and dataset in your workspace marked with an asterisk. Clicking on the tiles will drill into the reports built on top of the data set. These reports include details on Outages and Health checks, selecting the “Total Outage Seconds” will bring you to the Outages report. Navigate between the report pages using the named tabs at the bottom. You can hover over any of the visualizations to see additional details about that specific data point. Selecting any of the values will cross filter the other visualizations, and you can use the slice in the top left to view a subset of the data by data source. The report can also be moved into Edit Mode which will list all of the tables and fields that are included in the dataset. This mode allows you to add filters, create or modify visualizations and add new report pages. Selecting a visual will highlight the tables and the fields in the Fields list corresponding to that visual to make it easy to update or change the visual. You can also try asking a question of your data. The question box on the dashboard will provide a list of suggestion questions you can ask of the dataset. You can also use the “How to ask” option to learn the best types of questions to ask. You can continue building on the suggested questions by adding additional values. 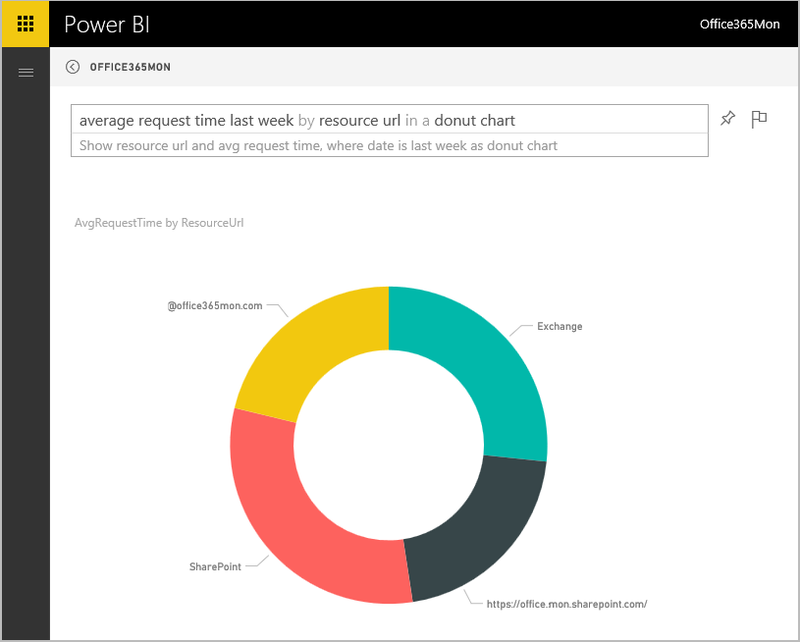 For example, you can further refine the question “average request time last week” by adding “by resource url in a donut” to produce the chart below. The Field list and Visualization panels are still available on the right hand side to tune your results. Any of the visualizations be pinned back to the dashboard to further customize it. When you pin a visual you’re prompted to choose which dashboard to pin to, allowing you to build up a dashboard with tiles from multiple different reports. After you initially import the data, the dashboard, reports and data set will continue to update daily. Select Schedule Refresh on the data set to customize and control the refresh schedule. 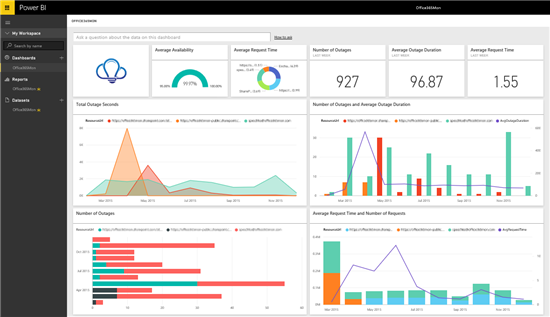 The Office365Mon content pack for Power BI helps you visualize and explore an initial set of metrics and reports that can be customized for your scenario.